We are now just over one week away from college basketball’s Selection Sunday, which means you have exactly 10 days to know everything about the most dominant teams this season. To help you on your journey, we’ll be providing quick guides to relevant teams, players, and story lines, as well as Grantland coverage you might have missed. Enjoy! • No. 4 Duke is an incredibly inconsistent team and disappears for long stretches at a time. The Blue Devils fell to unranked ACC opponent Wake Forest 82-72 in Winston-Salem after a week off from playing. Duke suffered a field goal drought for five minutes, giving up 17 straight points to the Demon Deacons. This loss all but guarantees that the Blue Devils won’t secure a no. 1 seed in the tournament. Their final regular-season bout comes Saturday at home against no. 14 North Carolina. • No. 3 Arizona continues to do well without Brandon Ashley, keeping up its Pac-12 win streak after falling to both Cal and Arizona State in early February. The Wildcats didn’t look especially dominant last night against Oregon State and allowed the Beavers to hang around until the final minutes. If Arizona can maintain its low turnover rate (it had eight to Oregon State’s 17) and remain dominant on the glass, it’ll make a threat in the tournament. • No. 8 Kansas won its last regular-season home game last night against Texas Tech with help from senior Tarik Black, who went a perfect 9-for-9. The Jayhawks played without freshman center Joel Embiid, who will sit for the rest of the regular season with a lower back sprain. The other two NBA prospects — Andrew Wiggins and Perry Ellis — looked good, too, with Wiggins adding nine points and Ellis finishing with 13 and five. Minus some hiccups along the way, Kansas has proven to be quite the dominant force all season, though at times its young core fails defensively and is unable to close out close games. Regardless, the combo of Wiggins, Embiid, Ellis, and Wayne Selden is a tournament must-watch. • After suffering five terrible losses in six games from January 14 to February 1, no. 9 Wisconsin is definitely back up on its feet. The Badgers closed out its eighth straight win last night, guided by big man Frank Kaminsky’s 22 points and 4-of-5 shooting from behind the arc. Though a win over Purdue is certainly not a huge résumé booster, its recent run proves the team can hang with the best of the Big Ten (its streak includes wins over three ranked teams — Michigan State, Michigan, and Iowa). If the Badgers keep it up, this could be the year Wisconsin sneaks its way into the depths of the NCAA tournament. • No. 10 San Diego State didn’t look particularly imposing against Mountain West opponent UNLV and needed a 13-2 run in the final 3:04 to pull out a 73-64 victory. Still, this Aztec team is one of the best in school history, notching its 26th victory of the season to match the second-highest single-season total in SDSU history. The team’s disappearance over a four-minute stretch in the first half, which led to a 10-0 Runnin’ Rebel stretch, is a definite cause for concern. The Aztecs did follow up with a 15-5 run of their own but gave up nine more points with just under five minutes remaining to enter the locker room down by one at halftime. SDSU hasn’t faced many strong opponents recently, though it does boast a November win against Creighton and an early January win over Kansas. Playing in a weak conference doesn’t do the Aztecs (or the viewer) too much good, but we’ll get a better idea of their strength when they host 21st-ranked New Mexico on Saturday. • No. 6 Villanova will be looking for a win over Xavier tonight to clinch its first outright Big East title since 1982. The Musketeers won’t give up easily, though, as they’re seeking a tournament berth of their own. Xavier is 1-2 in games against Top 25 opponents, the recent win coming against Creighton on Saturday. They’ll have to play without key center Matt Stainbrook, who sprained his MCL on Monday. Villanova has another thing going for it — during its four-game win streak, it has held opponents to 36 percent shooting and 59.3 points. • Tonight’s AAC schedule features a fun game between two ranked opponents — no. 20 Memphis and no. 15 Cincinnati. The Bearcats have lost their cushy hold at the top of the conference after losing to Louisville and Connecticut and are currently tied for first with the Cardinals. Cincinnati is suffering from a sort of shooting drought, scoring just 55, 57, and 45 in its last three losses (shooting 35, 29, and 27 percent, respectively). Memphis, on the other hand, has looked a little better, adding a big win over Louisville earlier Saturday after dropping two of its last four games, including one in overtime to Connecticut. The two are both still ranked in the Top 25, though the two have looked quite sloppy in the past month. Regardless, tonight will be a good chance to scout the AAC talent, whatever that turns out to mean. • Rounding out tonight’s schedule is a match between two of the less-imposing Big Ten teams: no. 24 Iowa at no. 22 Michigan State. The Spartans started off the season on an extremely strong note but have since seen a huge decline in performance and are now out of the running for the Big Ten regular-season title. The oft-injured team has dropped three of its last four games, though all of those were by single digits. Neither Adreian Payne, Branden Dawson, nor Keith Appling has looked stellar, which is to be expected after suffering a right food sprain, broken hand, and wrist injury, respectively. 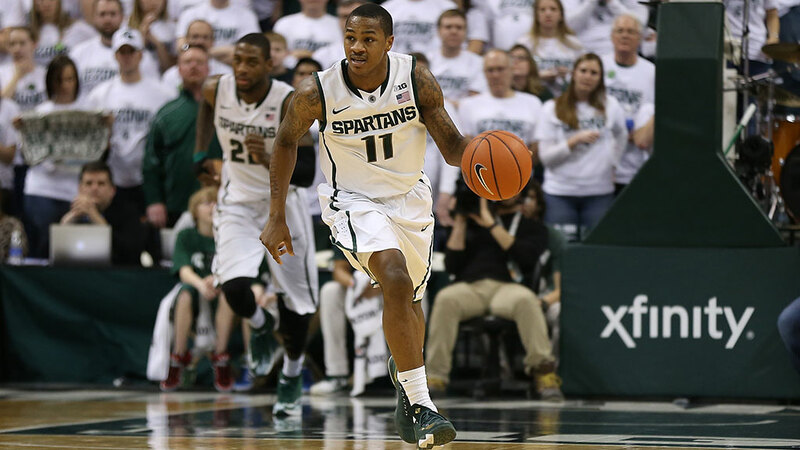 Given the injuries, at least the Spartans can rely on sophomore Gary Harris, who’s averaging 17.9 points per game. With its lineup slowly coming back together, Michigan State should start resuming its previously dominant standing in college hoops, though exactly how soon that turnaround can happen remains to be seen. Iowa has a lot at stake in this game as well, particularly after suffering a three-game skid before grabbing a paltry win over Purdue on Sunday. The Hawkeyes have had trouble finishing games, something they’ll need to work on if they hope to make a deep tournament run. Guys to watch tonight on the Iowa end: Roy Devyn Marble and Aaron White.